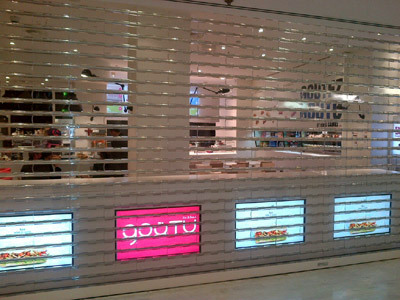 MAXIVISION, new generation of transparent roller shutters, patented, is composed by large transparent polycarbonate elements, worldwide unique, offering a panoramic vision of shops. MAXIVISION, is designed to provides a secure clear view, enables to advertise your products and to show off shop window displays all times by offering up to 95 % vision, without sacrifying the security and durability. Transparency and views are really incomparable, maximum and crystal clear during day and night maximizing the commercial architecture. With its fantastic see-trough effects and outstanding appearance, the fronts are chic and the stylish design combines a very high level of security. MAXIVISION, fit in perfectly with the beautiful looks of shops.